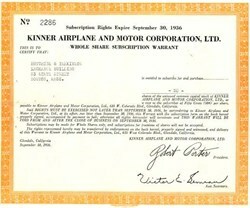 Beautifully engraved whole share subscription warrant certificate from the Kinner Airplane and Motor Corporation, Ltd. issued in 1936. This historic document was printed by the Jeffries Banknote Company and has an ornate border around it. This item has the printed signatures of the Company's President ( Robert Porter ) and Assistant Secretary and is over 68 years old. Kinner Airplane & Motor Corp. was founded in 1919 by W.B. Kinner to produce radial engines. The company also produced light general and sport aircraft. Kinner went bankrupt in 1937 selling his aircraft rights to Timm Aircraft and engine rights to a new Kinner Motors. The new Kinner produced thousands of engines for trainers during World War II. The second Kinner Motors was sold to a scooter manufacturer in 1946.